This month&apos;s We Should Cocoa is hosted by Choclette who has given us the summery challenge of ice cream. Last month&apos;s mint round up can be found here. 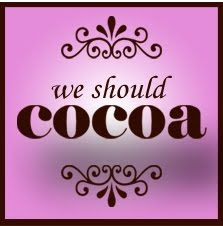 You can read all about We Should Cocoa here and don&apos;t forget to check out Choclette and Chele&apos;s blogs. My desk calendar provides me with zen like pearls of wisdom everyday. Sri Swami Satchidananda, Buddha, Ghandi et al urge me to be soft in my practice, that man cannot be polished without pressure and not to follow in people's footsteps but rather to seek what they seek in my own unique way. Which lead me to think "If I had a pearl of wisdom to bestow on someone, what would it be?" 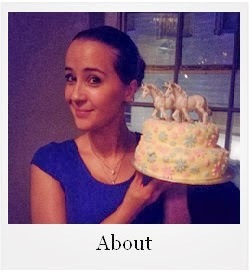 I could take inspiration from my favourite quote on Pinterest. (N.B - bit sweary). It could be practical like how to season a wok or how to successfully make a meringue or even how to get candle wax out of a table cloth. It could be profound. It could be life changing. It could inspire you to do great and wonderful things. "Please, for the love of all that is holy, DO NOT look at pictures of ice cream on the internet at 7.34pm on a boiling hot train." You bring yourself into a world of pain. Your stomach will rumble. You&apos;ll look down at your tepid bottle of Diet Coke and think "Useless. Only an ice cream will make me feel better in this weather now". And then you will scowl until you get home when a faux Magnum just will not make things right. It&apos;s pretty obvious how I know this. 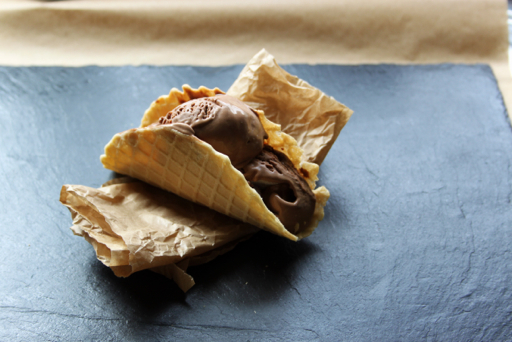 Of all the delicious iced beauties that I saw on my ice cream viewing bender, the chocolate taco stuck with me. With no hope of buying one in the UK, I set about recreating it. 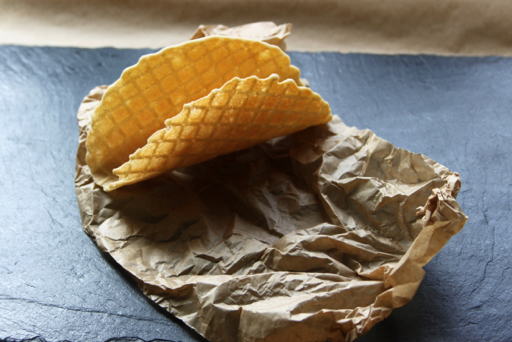 I made the waffle tacos using this waffle cone maker and the recipe included. I halved the recipe and ended up with so much batter let over. 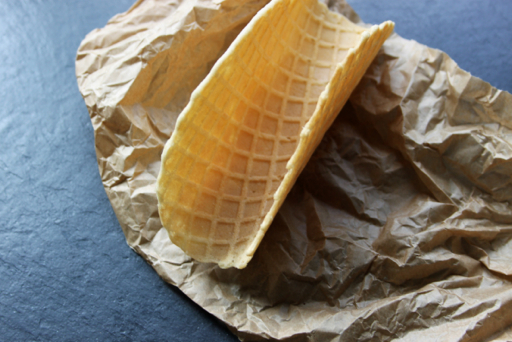 I haven&apos;t perfected small batch cones so I&apos;ll work on that one for you. 1, Whisk the egg yolks, caster sugar, cornflour and vanilla extract together until fully combined. 2, Bring the milk and 150ml of the double cream to just below simmering point and pour slowly onto the beaten egg etc using a whisk to combine. 3, Pour back into the saucepan and set over a low heat. Stir continuously until the custard has thickened and you get a nice thick covering on the back of a wooden spoon. Do not allow to boil as this will give you lumps. 4, Remove from the heat and allow to cool slightly. Pour in the rest of the double cream and stir through the chopped dark chocolate and ameretto. The residual heat from the custard will melt the chocolate giving you a smooth chocolatey custard base. Let this go completely cold before churning in an ice cream machine as per your machines instructions. This will fill about three ice cream tacos with three small scoops. 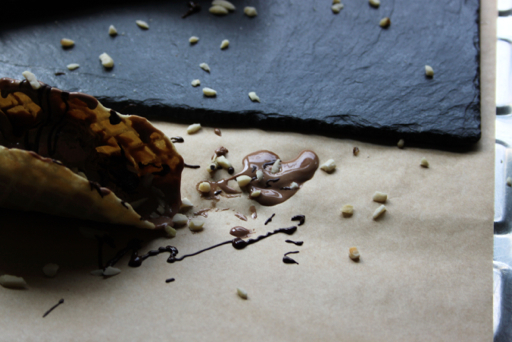 Top with melted chocolate and nuts, because an untopped taco is an unloved taco. Thank you :) They were beautifully messy to eat! What a clever idea! 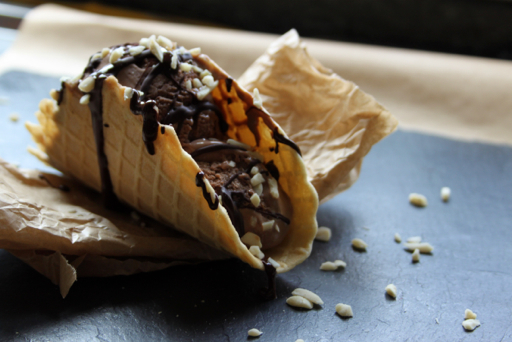 I adore amaretto and chocolate together, I bet this taco tastes delicious. Thank you Jude, horrible train journeys often give me time to think about things for this blog! I'll bear your tip in mind on future hot train (or indeed car/plane/boat) journeys! These look lovely - I won't be able to get them out of my head now either! Please do Katharine! If I can save one person from the pain I went through then I will be a happier person! What an awesome idea! 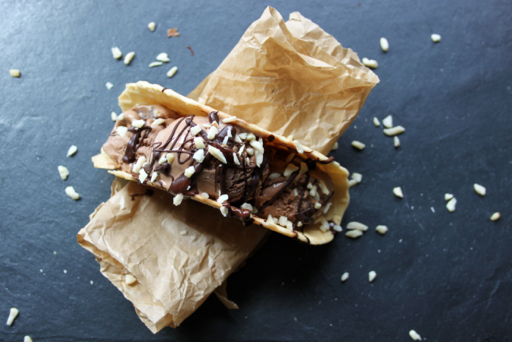 The new ice cream sandwich... the ice cream taco! Very inventine. I hope these start appearing on the market soon! Thank you Hazel :) I think the ice cream taco is perfect whatever the weather. Much like a normal taco. 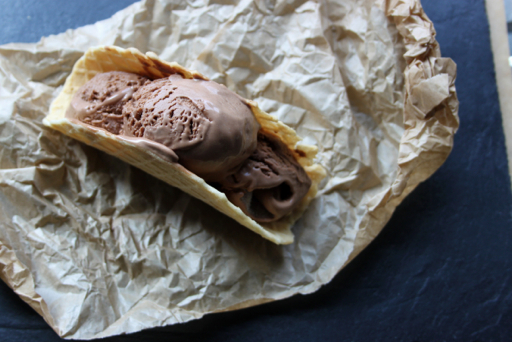 chococlate - ice cream - tacos - !!!!!! i am not on a boiling hot night train (it's a dreary sunday afternoon here in hobart) but now - NOW! - i want chocolate ice cream tacos too!!! incredible. i'll stop using exclamation marks now. Oh Hannah, you do come up with some marvellous creations - one of the upsides of the painful commute perhaps. Lovely flavours and I'm so glad you didn't leave your tacos unloved. Thanks for your entry as always. Thank you Choclette. Every cloud has a silver lining! I'm so sorry but I'm feeling your pain - I just looked at a blog post about damson gin and am now thinking about drinking gin in my garden tonight (weather permitting)!